Greater Des Moines Home Rent Rates Rise 20 Percent, Real Property Management and RentRange Findings Reveal. 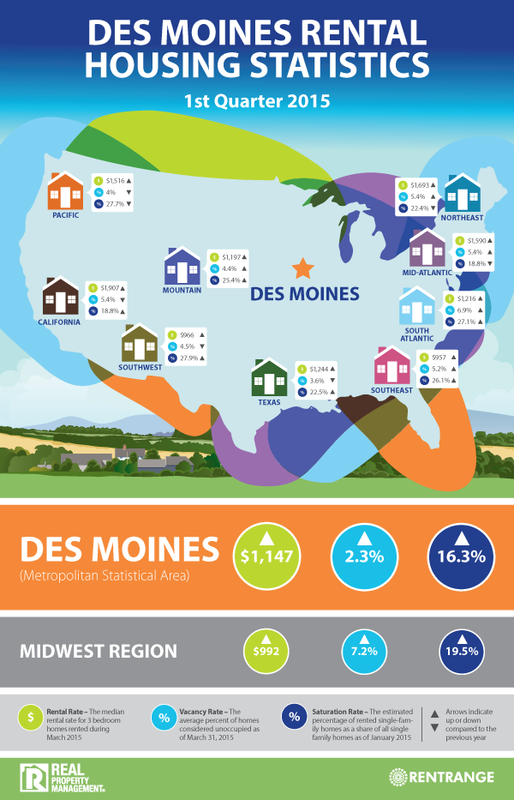 Greater Des Moines, Iowa – (June 9, 2015) – Real Property Management in the Greater Des Moines area, part of the nation’s leading property management franchise, and RentRange, the nation’s leading provider of Rental Market Intelligence™, together release rental housing statistics that show Greater Des Moines rental home rates are rising. Through the first quarter 2015, the companies reveal that the average monthly rental rates for single-family homes in Greater Des Moines was $1,147 representing a 20 percent year-over-year increase. Nationally, home rental rates rose 5.4 percent year-over-year to $1,286. The rental rates market data was limited to three-bedroom single-family homes in the U.S.
Real Property Management and RentRange also looked at vacancy rates in the Greater Des Moines area, the percentage of homes considered unoccupied, through the end of the first quarter. The Greater Des Moines rental rates rose to 2.3 percent, up 3.2 percent year-over-year. The national rental rates rose slightly to 5.7 percent, up .09 percent year-over-year. Lastly, the statistics include the saturation rate in the Greater Des Moines area. This is the estimated percentage of rented single-family homes as a share of all single-family homes. In Greater Des Moines, 16.3 percent of single-family homes are rented, according to the data.